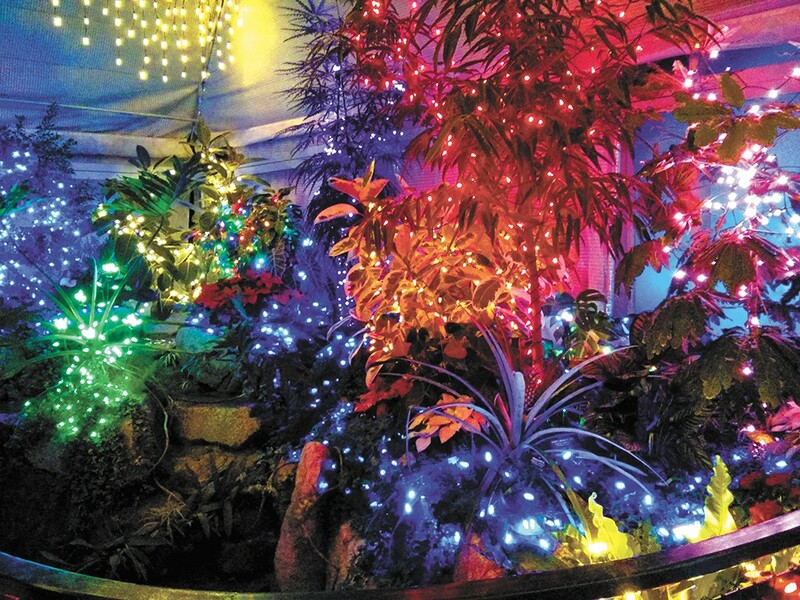 The annual holiday lights display at the Gaiser Conservatory this year is Dec. 11-20. The Scott family has been going every year for perhaps as long as the event has existed, starting back when I was in middle school (for context, that was 13+ years ago). No matter how busy the holiday season gets, we can't miss the Gaiser Conservatory holiday light display at Manito Park. One of the most stunning Christmas light displays you'll ever see in the region, the Friends of Manito event started out as one of Spokane's best kept secrets. There were no lines, and it was never crowded. But we're glad to see more people discovering an event that's become such a beloved holiday tradition for our family. While decorating the greenhouse's botanical specimens with strings of brightly colored lights seems like a basic concept, the volunteers who spend countless hours ever-so-carefully stringing lights atop cacti, Birds of Paradise plants and the more than 100-year-old Christmas cactus decorate things a bit differently each year. After so many years going, you notice the little things like that. If you and your loved ones want to make this a cherished moment of the season, too, the 2015 event is set for Dec. 11-20, and is open daily from noon-7:30 pm. It's free to go, but donations are welcome to support the Friends of Manito's efforts. What would the holidays be without the soft glow of strung lights? From tiny, wide-eyed babes to the family's oldest members, we're all cheered by their joyful illumination, brightening the dark winter days with bursts of color and warmth. Opportunities to 'Ooh' and 'Ahh' at these twinkling orbs are plenty across the Inland Northwest this time of year, both indoors and out. Exceptions are definitely allowed, and encouraged. For the Spokane Public Libraries' annual Teddy Bear Teas, local children are invited to bring along their best stuffed friend no matter their, um, species. Each December, public library branches across the city host kids' storytime events to celebrate this classic icon of American childhood. The tradition of teddies dates back to the beginning of the 20th century, when the stuffed toys named after President Theodore Roosevelt were first made. While some details of the toy bears' origin story aren't as lighthearted as their comforting nature suggests, it's definitely true that teddies and their stuffed animal counterparts play an integral role in the imaginative adventures of childhood. Dec. 12, from 10:30-11:30 am, free, Indian Trail Library, 4909 W. Barnes. More event dates and locations at spokanelibrary.org/calendar. For local families who don't need to worry about having a safe, warm place to sleep or where their next meal is coming from, the holiday season can have a broader focus on sharing with those who have less. It can be an immensely rewarding experience to take the family out for a fun shopping trip to pick out gifts on the wish list of someone who truly needs them. The Tree of Sharing set up its donation stations at River Park Square, NorthTown and Spokane Valley malls a week ago, handing out tags with specific requests — basic necessities like clothing and personal care items — from clients of all ages served by more than 50 local social service agencies. It's easy to fulfill someone's request: Pick up a tag, go shopping, and then return the tag and your gifts to the Tree of Sharing tables by Dec. 13. More information at treeofsharing.org. Toys for Tots is also ramping up collections of items wished for by kids across the Inland Northwest. Community members who can't manage to get their children something special this season can put in specific requests to the nonprofit, run by the U.S. Marine Corps, to pick up a gift when the order has been fulfilled. Monetary donations (which can be made online) and donated toys both help the Marines fulfill these children's wishes. Dropping off a donation is super easy, too — there's an extensive list of participating drop-off sites at spokane-wa.toysfortots.org.